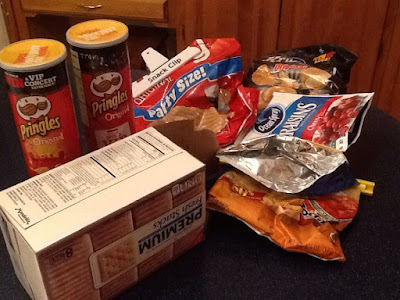 Things that make me crabby #78: bags of chips with nothing in them, cans of pringles that are empty, craisins bags filled with air, and a cracker box with three crumbs inside. I'm stomping, mentally searching for a new mantra. My usual perspective check, that of counting my blessings, reveling in the health of my children and my own, is sadly doing nothing. I'm so crabby. So crabby I can't even bring myself to be kind back to the cashier at the grocery store who spent TEN YEARS working with Mother Teresa. How's that for sinking to shame-filled depths. I'm in a bad mood and people trying to talk to me moves me from crabby to crabbier. People who don't know things who think they do and so say, "Smile!" are making me crabby. "Hungry, tired, with a headache and a to-do list that I don't want to do" That's my twitter bio you just read. I think it was all triggered with football being on every Sunday night from now until January. That's a long time to listen to that in the background. But the match was already lit. When people say I'm crabby, like I don't know that, that really makes me crabby. The vagebooking posts that seem to be the thing to do on FB aren't helping any of this at all. I am feeling why they call it *crabby*--I just want to run up to people and pinch them. I desperately hoped for self-help so I looked up "What to do when you're crabby", I'll tell you the advice I read from a trained therapist: Discuss your feelings. Me: I feel crabby that there's stuff all over the house. Me: I don't like how the dishes are always all over the kitchen island and counter. Me: Why is there laundry always all over. Why. Me: Why am I the only one that sees how the garbage spills out of the garbage can? Me: Is there a reason, any reason, why the snack cabinet is filled with empty bags and boxes? Me: One last question, why would there be scissors and two sharpies sitting in front of the front door? Anyone? I walked around discussing my feelings with all offenders and well... shazaam. It worked. I talked to the coffee table, the laundry in the hallway upstairs, the dishes that sat not put away on the kitchen counters. I shouted Good and Loud at every single thing making me crabby in this house. Some magic spell took hold by me yelling at objects at a level loud enough to shake tablets out of people's hands. This exercise worked like a charm. Kid #1, 2, and 3 jumped up and put everything somewhere I don't care. This house is now filled with peace and serenity, like the minutes after a summer storm. A lot of lightning and thunderous banging, and what do you know. Mama bird is back to chirping gaily in her nest once more. I do that too. It's the perfect pressure valve. Unfortunately, in my house, there will still be empty boxes of snacks in the pantry, shredded cheese all over the counter, half consumed drink glasses on the table and some kind of brown stuff dripped down the cabinets (my morning) tomorrow, but at least you feel better and are less likely to use your pincers on some unsuspecting grocery store clerk. Pressure valve is the perfect word for it! Tried it before, didn't work. Husband is deaf. So now I get up an hour earlier than he does so I have time to take the coffee filter out of the coffeemaker and place it neatly into the garbage. Saves me having to sweep up slung out coffee grounds from the floor around the garbage. And that is just one thing. Getting my own apartment is starting to look really good to me. I confess to dreaming about a tiny little space of my own, too. I was nodding along vigorously until I got to here, "I am feeling why they call it *crabby*--I just want to run up to people and pinch them." and then I just started laughing out loud. Which I needed. Yesterday, I called my husband and told him I was giving him my two weeks notice unless we figured out a new arrangement. Smart man sent flowers and brought home Chinese with an order of crab rangoon just for me.